The all new “true crime” case in Fargo’s latest chapter takes you back to 1979 in Sioux Falls, South Dakota and Luverne, Minnesota. “Lou Solverson” (Patrick Wilson), a young State Police Officer recently back from Vietnam, investigates a case involving a local crime gang, a major mob syndicate and a small town beautician “Peggy Blumquist” (Kirsten Dunst) along with her husband “Ed” (Jesse Plemons), the local butcher’s assistant. Helping Lou piece things together is his father-in-law, “Sheriff Hank Larsson” (Ted Danson). The investigation will lead them to a colorful cast of characters that includes “Karl Weathers” (Nick Offerman), the town lawyer of Luverne, Minnesota. A Korean War vet, Karl is a flowery drunk blessed with the gift of gab and the eloquence of a true con artist. Three-time Emmy® winner Brad Garrett will play “Joe Bulo,” the front man for the northern expansion of a Kansas City crime syndicate. The new face of corporate crime, Joe’s bringing a Walmart mentality to small town America. His number two is “Mike Milligan” (Bokeem Woodbine). Part enforcer, part detective, Mike is always smiling – but the joke is usually on you. Bulo and his crew have their sights set on the Gerhardt crime family in Fargo, currently led by matriarch “Floyd Gerhardt” (Jean Smart). With her husband at death’s door, Floyd takes over the family business, frustrating her eldest son, “Dodd Gerhardt” (Jeffrey Donovan). An impatient hothead with a cruel streak to match his ambitions, Dodd can’t wait for both his parents to die so he can take over and expand their business from kingdom to empire. “Bear Gerhardt” (Angus Sampson) is the middle son, an intimidatingly large man who, although inarticulate, is the most decent of his clan. “Rye Gerhardt” (Kieran Culkin), the youngest of the Gerhardt clan, views himself as a big shot, but in reality he’s just a small dog with a loud bark. Fargo images are © 20th Century Fox. All Rights Reserved. The events depicted took place in Florida in 2016. At the request of the survivors, the names have been changed. Out of respect for the dead, the rest has been told exactly as it occurred. Open scene. A man sits at his computer working diligently on some advertisement that needs to be finished immediately. Of course it's a "Rush" but then everything seems to be a "Rush" these days. His attention drifts slightly and dissipates, maybe some tea will bring some focus. He walks down the long corridor, passing employees he knows, turns his head as a short skirt passes and refocuses as he turns into the kitchen to make a cup. Two of his co-workers are on break. "Hey, have you been watching American Horror Story?" one says to the other. "Nah, I'm a season behind." The man fills his cup with water and puts it into the microwave. The first asks, "So what are you watching?" to which the other replied "Billy Bob Thornton's new series Fargo, not the movie. It's different. Good different" 3…2…1….Beeeeeeep. The cup comes out of the microwave and as he places the teabag in he eavesdrops some more.. "Yea, I was surprised how good it was. I started watching it and they were killing people left and right. My kind TV!" He grabs his cup and starts the long walk back to his desk thinking to himself Billy Bob Thornton's in something good? Six months pass and this man is sitting at his desk, a mound of work piled up and staring at the rain running down the window. What was that? He heard it again. He pulled his headphones off letting the instrumental movie scores he was listening to drift out into the open air. He listened closely as his coworkers chatted as they worked along. "Yea you've gotta check out Fargo! I hear they renewed it for a second season but they pretty much killed everyone so I have no idea how they will pull that off." He thought to himself, maybe I will check that out, some rainy day. When I'm not piled up with work. He then placed his headphones back on, and went back to work as the theme from The Godfather played in his ears. While he worked in advertising, this man did freelance reviews for movies. Not like he had of spare time as it was but movies and TV always were the great escape from reality. But the day came where he was asked to review a series. "I put it in your backpack. If you can get it to me ASAP" He was told. He got home, opened his backpack and it was Fargo, Season Two. He thought "I guess that time is now." He blew through season one like it was a weekend away at an amusement park. He agreed with that coworker, he once listened in on, that Billy Bob Thornton was really good in a very creepy way. And as season one came to a close he had the same question. They ended the story. How would one continue a concluded story? He went to bed staring at the ceiling looking forward to a second chapter. The next day the man put his pants on, filled his Tervis and went on his way to work knowing full well that no matter what the day brought, he had plans for some good TV that night. The day passed by like you would see in cartoon going from day to night in a blink. He drove home, kicked his shoes off and placed the first disc of Fargo Season Two in the BluRay player. He kicked off his shoes and sat in his favorite chair, indented to fit his posterior. And in the silence a phone rang out. His wife answered, she screamed out and turned to tears, he knew something was wrong. While we know people dying on screen is fake and stories may be made up, someone dying in real life is not the same thing at all. The next few days he spent consoling, going thru photos to be used and preparing not only himself, but others for a funeral and a wake… a WAKE? "Aren't they for the Irish" he thought to himself all the while admitting he himself, was half Irish. While no one could ever be prepared to be a pallbearer, he never thought in his lifetime he would be carrying a coffin to its final resting place. But as he did his mind slowed, taking in every second, he thought to himself "do not let go" as the walk across the graveyard seemed to get longer and longer. He placed a single white rose on the coffin, and as they lowered it down, he held his wife. Saying life is short at this moment is rather pointless. Days passed as emotions would come in waves from sadness to just numb. He tried to think of good moments from the past as he saw the sad stares from coworkers, that look of "I don't know what to say" and read the emails and texts with coined phrases that hallmark made millions from. And as if things weren't bad enough, the events of the past days had worn his immune system down and he got sick. 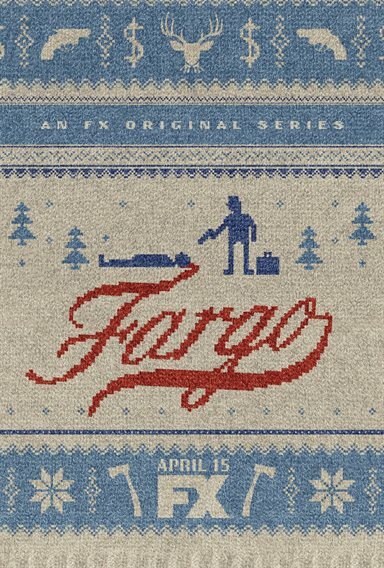 As he sat on his sofa, sniffling and coughing, almost to a point of annoyance even to himself, he thought "I need a distraction, a good one" he looked over and in front of his TV laid the case for Fargo Season Two. He broke a smile. He made himself a cup of tea with honey to sooth his throat and started disc 1. As the stylized episode began, a disclaimer came up. "The events depicted took place in Minnesota in 1979" and he thought to himself "I remembered that time, I was 10." He watched as a Skip, (what mother names her son skip he thought) who wants to sell "the future", some special IBM self-correcting typewriters, convinces this sleazy looking man named Rye (bread, his mother named him after bread?) to go work over a judge. Go convince the judge to unfreeze our assets us and we can make millions." Well this judge doesn't take too kindly to being coerced dontcha know. She pulls out a can of bug spray and sprays it in his face. No fear this lady has I'll tell ya. Then, Rye proceeds to shoot her, the cook and the waitress! With his back turned the judge stands up and stabs Rye in the back and he returns firing more than just a "Double Tap" but as he turns around again, the waitress is gone. He leaves the waffle hut he just shot up walking out into the frozen night landscape and sees her in the distance. He runs out further into the snow, stops and while the flurries fall, shoots her in the head. She drops to the ground. It is at that precise moment a light shines from overhead onto Rye. (no they didn't go there! He thought to himself. Really??) A UFO hovers over Rye like divine intervention and in a blink it flies away. And as that quiet second passes, CRASH! A car comes out of nowhere making Rye a hood ornament. Not five minutes in and he is hooked. Still sniffling, the outside world seemed to vanish for a little bit and he thought maybe someone out there is having a worse day then me…dontcha think? He watches as this Peggy chick, who seems not to be all quite there, has her husband come home from a long day at work to hear sounds coming from the garage. Ed goes into the garage and finds a hole in the windshield and blood all over the car. He hears a noise again, and with his not so trusty flashlight, he investigates. This Rye character is a tough one! He rushes Ed and with a little tussle Ed stabs and kills Rye permanently with a gardening tool. (He thought jokingly to himself "my wife would have made sure he was dead" and cracked a smile) Peggy then convinced poor Ed that they should cover it up. Make it all go away or they could loose everything. The sad truth of the matter is….they already had. They just didn't know it yet. It turns out Rye's last name was Gerhardt….as in the Fargo Gerhardt Mob family! Yea it seems as if little miss blondie ran over one of the sons of the most dangerous families in the Upper Midwest. (Poor Ed he thought to himself. Sympathy for Peggy was pointless she drove all the way home with a body on the hood! Who does that!?) If that wasn't enough to deal with, it turns out some strong men from Kansas City were sent to "acquire" the Gerhardt's stake in the operation. So Peggy and Ed are in it deep. They may be able to cover it up for a bit, but you know it always comes out in the end! He sat and watched, and as he finished the first and then the second and the third passed as if there was no stop button. Was it the Godfather-like mob war that had him so interested? Was it how the blonde and the butcher seemed to have never ending luck? Was it the puzzling question of how the colors rust orange, avocado and yellow were so popular not as isolated colors but as in a color grouping in the seventies? He stopped to sleep and after calling in to work slept more. He woke up at 4pm and the first thing on his mind was soup and to continue with the series! His wife made him soup and as he continued watching, she sat down and started asking questions. Who are they looking for? Rye Honey, he answered. What happened to him? Well the blonde ran him over after he killed 3 people. The husband, the butcher, grounded him up to get rid of the evidence he answered. She replied, she's an idiot….You know I'd never ask you to do something like that, right honey? And just like that they were both watching….and as each episode finished, another started, and it seemed as if the worries of their world disappeared for a few seconds and they were just two people enjoying a great story….that was until another UFO showed up and she was like "Seriously? WTH??" …as the brilliant and haunting score from Jeff Russo faded out, reality started to seep back in. He turned the TV off and in the silence knew he had work to be done. He sat down at the computer, and with a nice hot cup of tea with honey sitting right next to the keyboard, he started typing…..with a slightly less typewriter sound….. 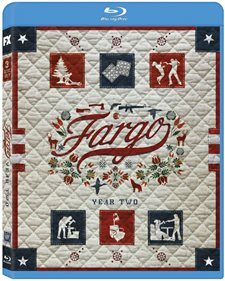 In addition to the full season of Fargo Season Two, both DVD and Blu-ray disc formats include five featurettes–"Lou on Lou: A Conversation with Patrick Wilson, Keith Carradine and Noah Hawley", "Waffles and Bullet Holes: A Return to Sioux Falls", "The Films of Ronald Reagan: Extended Fargo cut", "The True History of Crime in the Midwest", and "Skip Sprang TV Commercial"